← MAYOR DE BLASIO AND THE DOT’s RENDERING OF WHAT THE PROMENADE WILL LOOK LIKE FOR 6 – 8 YEARS. The “P” stands for park, and in BIG’s plan, green space takes center stage. The firm has proposed two scenarios for either repairing the BQE’s existing triple cantilever structure, or replacing it altogether. In both scenarios, the vehicles that use the BQE would be moved to a roadway that would be covered and topped with as much as 10 acres of new parkland. “The idea is to build the highway once, not twice,” BIG’s Jeremy Alain Siegel told the New York Daily News, which first reported the proposal. 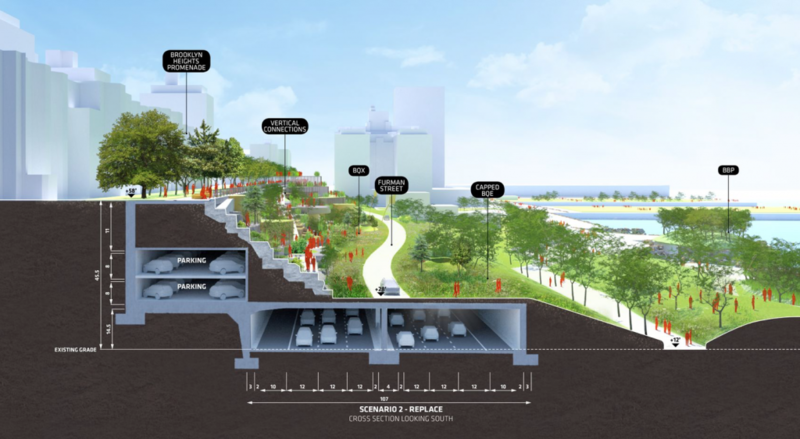 Under BIG’s plan, the existing Furman Street, (along with space that’s currently used for Brooklyn Bridge Park parking and the park’s sound-dampening berms), would be turned into a new six-lane roadway. Traffic from the BQE would be rerouted to that new thoroughfare, which would be decked over; Furman Street would be re-introduced on the deck for local access. Parkland from BBP could then be extended east, creating new green spaces and infrastructure for the community.